Every month, Kristin Addis from Be My Travel Muse writes a guest column featuring tips and advice on solo female travel. It’s an important topic I can’t adequately cover, so I brought in an expert to share her advice for other solo female travelers! Here she is with another awesome article! Mozambique isn’t a country on the typical backpacker trail. It’s rumored to be difficult and dangerous, but much like the rest of Africa, it’s misunderstood and prone to myth. Yet I came to find that once I got to Mozambique, most of what I heard was wrong. Yes, it was somewhat difficult to travel through, with long bus journeys and overfilled minivans. And yes, I had to keep my wits about me because that’s always important when you travel solo, but for the most part the beaches were beautiful, the piri piri seafood was delicious, and the fact that it’s not a tourist hotspot made it peaceful, too. It’s also affordable. Mozambique is the only country I’ve been to where I didn’t have to pay double to have a bungalow to myself as a solo traveler. It’s one of few places where I could buy a coconut for around ten cents, a mango for five cents, and a whole fish big enough to feed three people for around $6 USD. 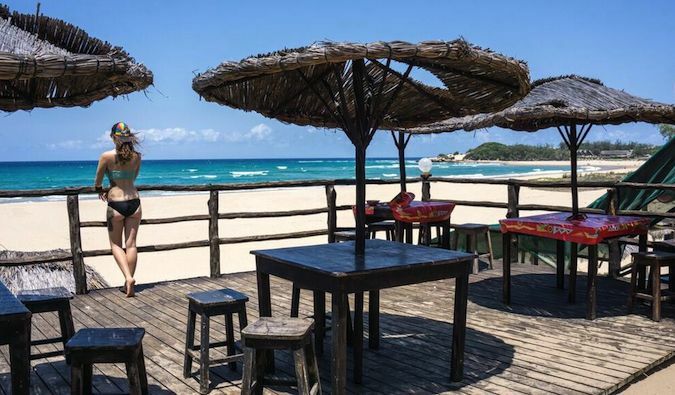 There are also a bunch of fun and interesting things to do in Mozambique that you can’t do anywhere else, especially in a destination as cheap and uncrowded as Tofo. Tofo is home to many famous scuba diving spots known for sightings of big sea creatures. Whales, dolphins, whale sharks, and manta rays are all known to frequent the warm, nutrient-rich waters of Mozambique. You’re also unlikely to have to battle with other divers for the best sites. There are only a couple of diving outfits in Tofo, such as Tofo Scuba, which charges around $30 USD per tank. 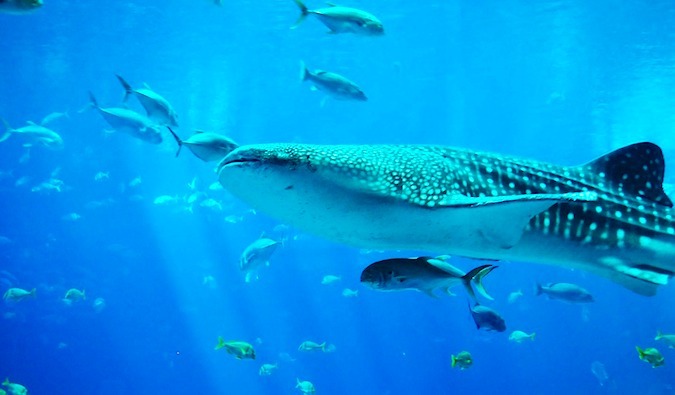 This means that if you spot a whale shark under the water, there won’t be hundreds of other tourists jumping in the water with you like in the Maldives and the Philippines. Tofo is the only beach destination I have ever visited where tourism actually appeared to be on the decline. Usually, I visit a beach and then find it’s completely ruined when I return a few years later, overrun with tourists. Mozambique is different for a few reasons, namely the difficulty of traveling there and the lack of general information available about it. That means that the people who you do meet there are usually really interesting travelers. They might be Peace Corps volunteers on their summer break, people from Australia or the States who work in agriculture, South Africans, or other travelers who were already in Africa and got there by word of mouth. The beaches are still beautiful, the sand is still clean, and the locals aren’t jaded yet. To me, that’s the perfect kind of place. Mozambicans are friendly. Those who can speak English are almost always interested in hanging out with foreigners, and sometimes you can enjoy a heartwarming experience as a result. Pictured above are Orlando and Nate. 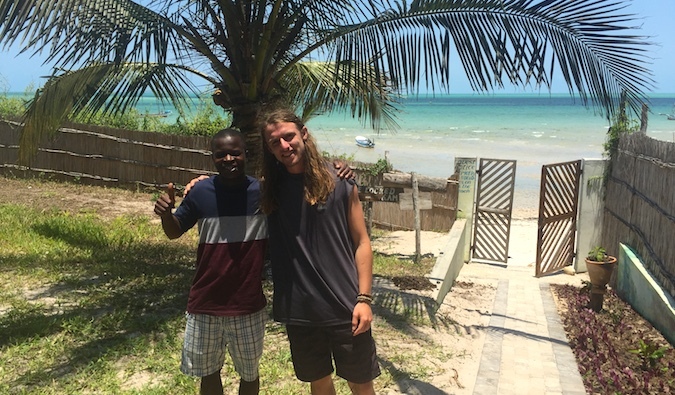 Nate is an American guy who decided to invite Orlando on his trip through Mozambique after learning that Orlando had never left his village. The relationship between the two was mutually beneficial, as Nate got to have a more local travel experience and Orlando finally got to see his own country. When I heard about it, this kind of thing didn’t surprise me, because locals were showing me around Mozambique all the time, as well as taking me to late-night dance parties and art galleries. 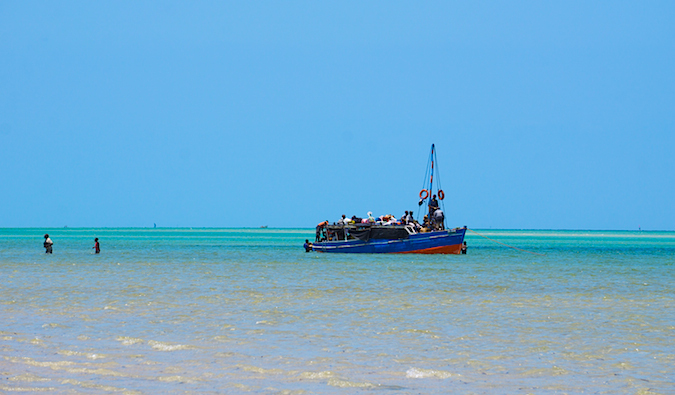 Boat trips are a fun and cheap way to fill an afternoon in Mozambique. In Tofo, you can usually organize one with a local or through your hostel with a group of friends for around $30 USD per person. It’s as easy as just asking the question: chances are good that someone will know someone who has a boat and can take you. It’s the way Tofo works. The boats are simple, with sideways sails and rudders made out of old wood. It won’t be fancy, but it will be beautiful. Bring your own beer, sit back, and enjoy. When you rent a quad bike in Tofo, you can take it through some of the small villages (and by small, I mean 5-10 grass huts) in the sand dunes behind the beach. Kids run out and either wave or decide to be little rascals and try to grab onto the back of the quad bike as you ride by. 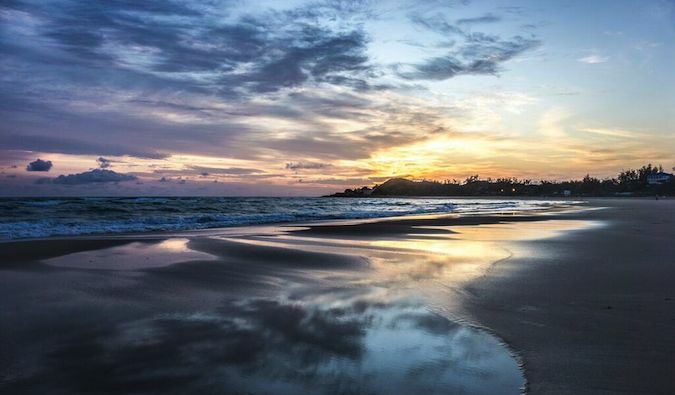 You can find all kinds of little enclaves and beaches that aren’t accessible directly from the beach in Tofo itself, or you can finally give yourself a ride to the ATM, which is otherwise a 30-minute walk away. Truth be told, most days in Tofo I just relaxed all darn day in a hammock, in a pool, in the ocean, or on the beach. It isn’t expensive, with a beer running just under $2 USD, a plate of seafood anywhere from $6 USD for barracuda or prawns to $12 USD for a whole lobster, and a private bungalow on the beach around $15 USD. It’s the perfect place to just lounge for weeks and listen to music with friends in between dips in the ocean and sunset walks — without feeling guilty for spending a fortune. A common way of getting around Mozambique is to hitchhike, called a boleia in Portuguese. Tofo isn’t big, but if you want to get to the ATM, which is a bit of a walk, a ride is much quicker and more fun, too! I took a few boleias that were somehow just as relaxing as laying on the beach — I sat in the back of a pickup truck and watched as we passed little villages with grass huts and hundreds of trees heavy with mango fruit. Some boleias are even boats. They’re easy to get. You just have to make sure you’re at a logical intersection in order to get a ride. Ask around before you give it a try, so as to get some intel from the locals. A note on boleias: I can’t recommend this as a solo traveler, especially if you don’t speak any Portuguese, and in general I can’t say this is the safest method of traveling, but, as mentioned, it’s common in “Moz” and the way that I, personally, usually got around. I’m glad that despite the mostly negative information I encountered about Mozambique, I listened to the few people who told me that it was a wonderful place worth exploring. I’m glad that I saw it for myself, and I’m excited to share it with you now. Just because a destination isn’t as well known doesn’t mean it can’t be wonderful. If you have a chance to go to Mozambique, take it, and come back and let me know how it treated you! 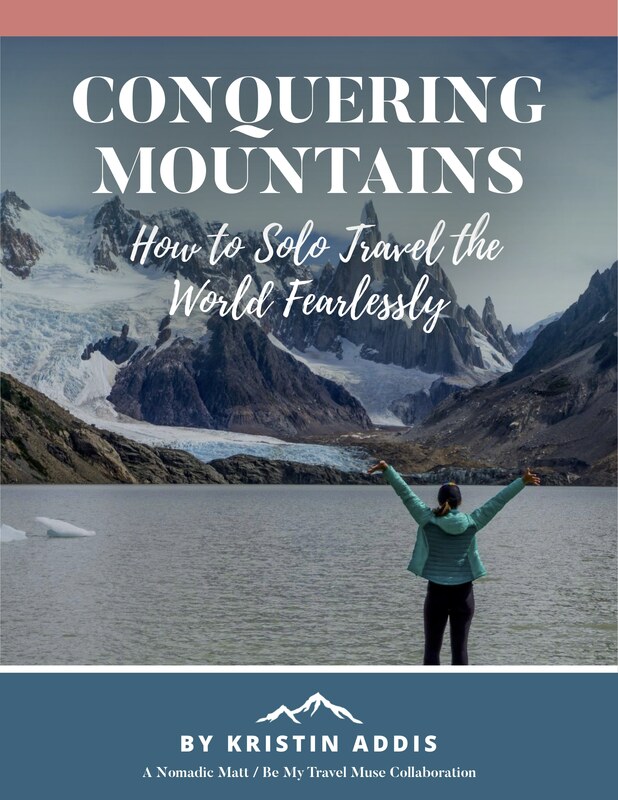 For a complete A-to-Z guide on solo female travel, check out Kristin’s new book, Conquering Mountains. Besides discussing many of the practical tips of preparing and planning your trip, the book addresses the fears, safety, and emotional concerns women have about traveling alone. 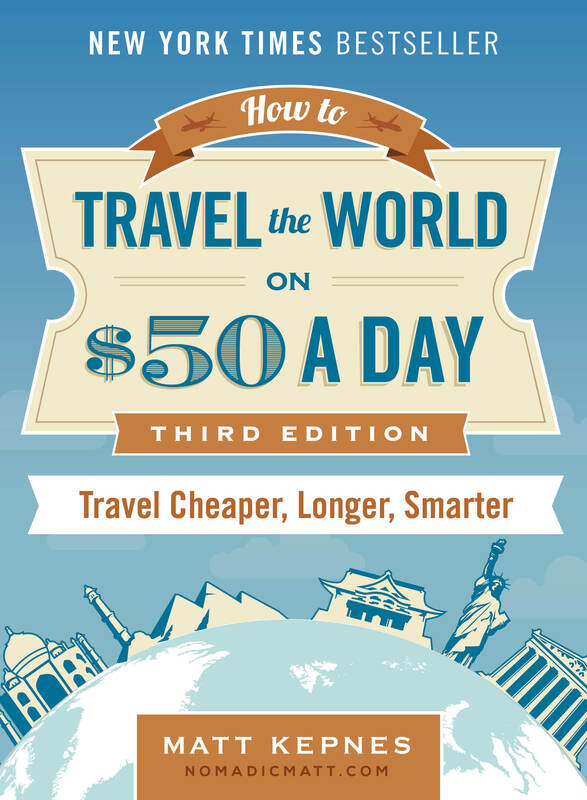 It features over twenty interviews with other female travel writers and travelers. Click here to learn more about the book, how it can help you, and you can start reading it today! Thanks for the advice on a place in Africa! I never get hear any because no one seems to go there. I can’t wait someday. It’s good to know the people are so friendly. 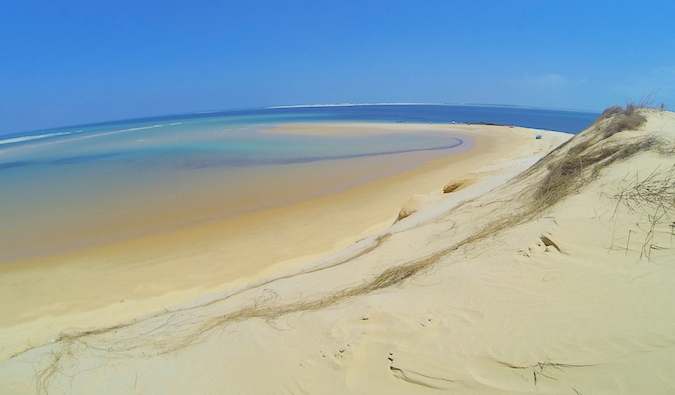 Mozambique is such an incredible country that few even think about travelling to. Its sort of in that grey area. Really though it shouldn’t be. Its packed full of culture and incredible sites. Great job Matt, people need to be more aware of how amazing this place is! 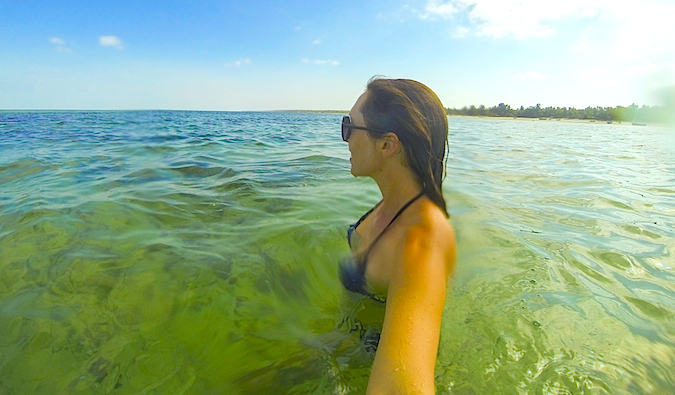 Loving all your Mozambique coverage, Kristin! I’ve been wanting to go for years (I considered doing my divemaster there) and you’ve given me a much clearer picture of what the eventual trip will look like. I was just chatting with someone who’s there at the moment and they were telling me how gorgeous it is! Added on my list as we speak! Lovely pictures and stories there Kristin. Per usual, many rumors concerning a less traveled land are false. A few basic ideas ring true. Be open guys! I have heard many, many negative things about countries I most enjoyed visiting. As for stuff to do I’d take the boat ride but since I’m not going solo it could be a better experience for me. Thanks for sharing! Oh wow! I have wanted to go here for years – it looks so beautiful!! I loved TOFO we only had 2 nights there on our overland African Safari, I could have easily spent a week here. 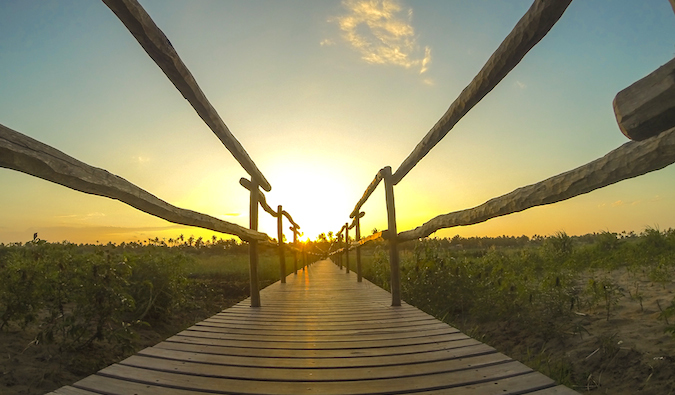 Mozambique, and Inhambane in particular have strong tourism potential. I love the country, i love the beaches, and Tofo is one of my favorite spots. Awesome! I’m planning to visit Tofo in Dec for a few days and will definitely take your recommendations into account. Re quad bike – is it easy to rent anywhere in Tofo and any recommended route to explore? Hi we’re very interested in traveling to Tofo, do you have any recommendations for hostels to stay at? Just back from a trip to Tofo with my family. Totally fell in love with the place. Everything you said here and more. So far I have only done 1, 3 and 6. Planning to go back for a month next year. I think my family know I don’t need much of an excuse to move us there fully! I am absolutely loved Tofo, when we went a few years back, a truly beautiful place but to me the most exceptional was how friendly the locals are, I remember when I must have been about 14,chatting to a guy at the beach hut which ended up with me and my older brother and 10 of this guys friends (girls and guys) in the back of a pick up going for drinks and dancing in Inhambane so much fun the girls loved me haha. We made so many friends there. The food was incredible, just the fact piri piri chicken comes from there should tell you enough but the seafood like you mentioned. We made many friends there, we did unfortunately meet a couple of exceptionally racist people who had come in to live there and typically hated the locals in almost an ancient way of thinking that you would have thought was extinct! But I’ve never been to a place like Mozambique through all my travels, still my favourite destination. And yes the views were incredible, walking onto a completely empty 3 mile long beach at 6 in the morning is amazing. Me and my brother were walking along the beach at maybe 2am one night the moon literally lighting everything up clear as day and we heard something behind us. Looked round to see around 12 Alsatians quietly walking just behind us! You can imagine our terror. But my brother being the calm one just said keep walking like they aren’t there. We just walked in silence and they walked with us, then my brother said sit down and they lay down with us! Haha, suddenly I’m in love with Alsatians, many people have them there and they are allowed to wonder out at night so I guess all the dogs get together at night. I had so many experiences there I could go on all day but my true fear is that it may have changed since I went (about 15 years ago). In a way I’m very happy it hasn’t too much, I actually almost don’t want anyone else to know how incredible it is as I fear it will eventually change but then we can’t keep these amazing places to ourselves, let’s just hope travellers like you and your friend continue to respect it.